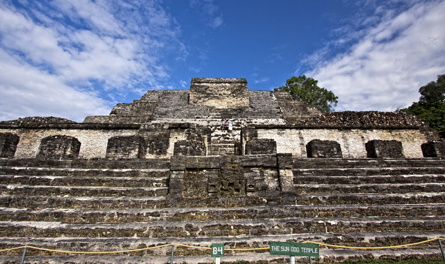 The history of Belize dates back thousands of years. The Maya civilization spread into the area of Belize between 1500BC and 200AD and flourished until about 1200AD. Several major archeological sites—notably Caracol, Lamanai, Lubaantun, Altun Ha, and Xunantunich—reflect the advanced civilization and much denser population of that period. European contact began in 1502 when Christopher Columbus sailed along the coast. The first recorded European settlement was established by shipwrecked English seamen in 1638. Over the next 150 years, more English settlements were established. This period also was marked by piracy, indiscriminate logging, and sporadic attacks by Indians and neighboring Spanish settlements. Great Britain first sent an official representative to the area in the late 18th century, but Belize was not formally termed the “Colony of British Honduras” until 1840. It became a crown colony in 1862. Subsequently, several constitutional changes were enacted to expand representative government. Full internal self-government under a ministerial system was granted in January 1964. The official name of the territory was changed from British Honduras to Belize in June 1973, and full independence was granted on September 21, 1981.